"I don't know what I'm supposed to do!!" 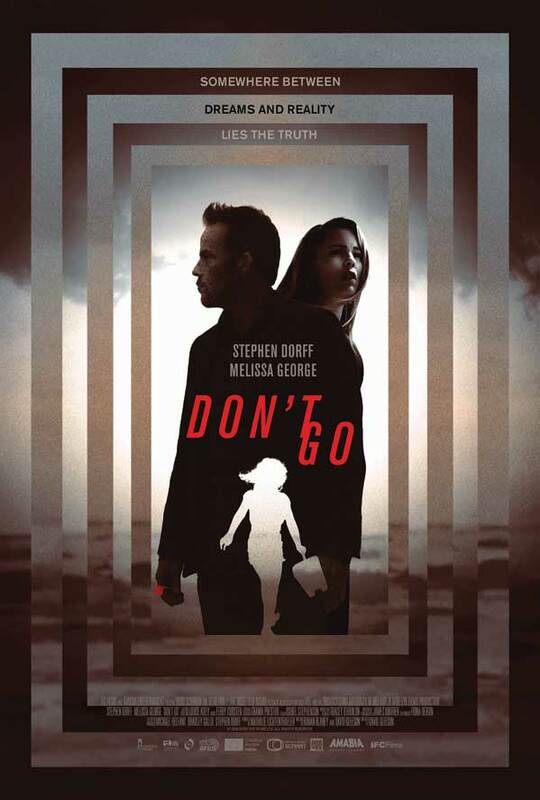 IFC Films has debuted an official US trailer for an Irish horror thriller titled Don't Go, originally titled Don't Let Go, the latest from filmmaker David Gleeson (Cowboys & Angels, The Front Line). Devastated by his daughter's death in a terrible accident, Ben becomes convinced that he can bring her back through a recurring dream on a beach. But is it only a dream? Or is Ben really losing his mind? Ben & Hazel end up pulled deep into a mystery far beyond their understanding. Stephen Dorff and Melissa George star as Ben and Hazel, along with Simon Delaney, Gavin O'Connor, Grace Farrell, and Aoibhinn McGinnity. The film features a score composed by popular EDM musician Ferry Corsten. This looks like an engaging, emotional, psychological horror that will really mess with your head. Reeling from the shock of their young daughter's death, Ben (Stephen Dorff) and Hazel (Melissa George) attempt to restart their lives in a picturesque seaside village. But when the girl begins appearing to Ben in a haunting recurring dream, he becomes convinced that she is attempting to make contact from beyond the grave—and that his nightmare may hold the key to bringing her back to life. As Hazel begins to fear for her husband's sanity, they are each drawn into a mystery far beyond their understanding. Don't Go is directed by Irish filmmaker David Gleeson, director of the films Cowboys & Angels and The Front Line previously. The screenplay is by Ronan Blaney and David Gleeson. The film premiered at the Galway Film Fleadh this year. IFC will release Don't Go in select theaters starting October 26th this month. Thoughts?